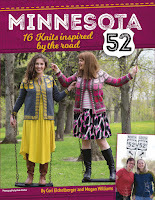 Knit Cahoots: Order Minnesota 52!!! * 1 shawl * a surprise design * and a delicious recipe for your travels. The book is 120 stunning pages featuring Gale Zucker's photography and graphic layout by Larissa Davis. All patterns were meticulously technically edited by Ellen M.Silva, and test knit. Book dimensions are 8.5 x 11 inches. Just saw your interview on Kristy Glass YouTube Channel. Came over here and bought the book 'cause all the patterns look like items I want to knit. Congratulations and best of luck! Watched Kristy Glass You Tube interview, I ordered your book. I love your story. I wish you all the best. I did too! Great story! Lovely knits! What sizes does the book go up to? Hi Christina! Thanks so much for your interest in our book! Our sweaters support a wide range of sizes, as do our other accessories. For instance, Friendship Road supports 30 inch bust to 58. And Snow Thank You sweater has 22 inch bust to 58. 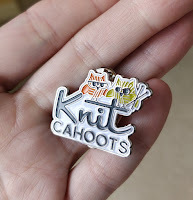 Saw you on Kristy Glass knits YouTube video and loved all the info you shared about how you met and progressed to creating this book. I needed to order the book and can't wait for it! hey! I have ordered your book. I love your story. I wish you all the best..just keep hard working on that.